Oh crikey, where does the time go?! I can't believe that we’re in the middle of February and gosh it’s been a long time since I last updated my blog. Many apologies for my lack of news. Life here in Pangbourne was incredibly hectic throughout December, culminating in a fabulous Christmas. Ali and I would like to thank all of our amazing customers who waited patiently in the cheese queue as well as all of our customers who had pre-ordered their cheese and so could skip the line. Our shop wouldn’t survive without the wonderful people who shop here, so thank you. I am always so chuffed with how our team pull together at Christmas and 2018 was no exception. Poor Angela was off work with a horrible flu bug and so missed her first retail Christmas ever, but Chris, Jan and Jonny took that in their stride and kept going alongside myself, Ali and Tara (our very efficient daughter who was in total charge of the cheese store). It was a hectic few days, but we all survived. Often January is a quiet month for us but this year we’ve hit the ground running. (Hence it taking me until Valentine’s Day to write this…) I’ve been busy heading out and about finding some new suppliers as well as some new cheeses. I wanted to get a hard Scottish ewe’s cheese in for Burn’s Night and so I went for the Corra Linn. It’s been so popular that I’ve just topped up our order. 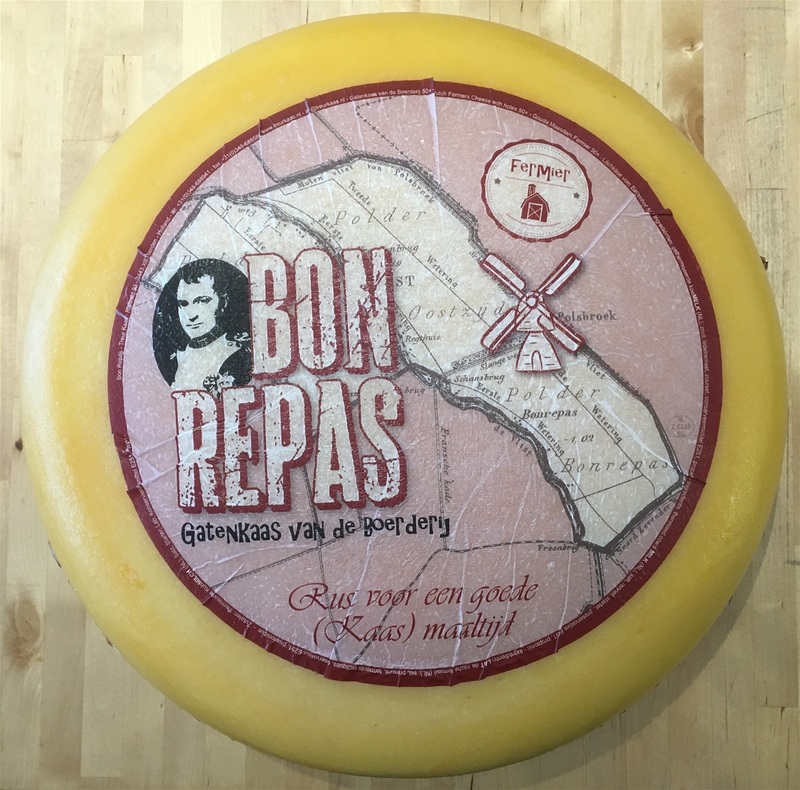 The batch we currently have in stock was made in 2016 and you can really taste the age of the cheese. It has a texture not dissimilar to a parmigiano reggiano and its flavour is reminiscent of roast lamb. I was doing some research (there’s nothing I like better than reading about cheese) and the cheese itself is named after a waterfall in Lanarkshire near where it is made. My father proposed to my mother next to a Scottish waterfall so that is one cheese fact that I will always remember! We also have a new cheese in the counter which is made just up the road from us in Nettlebed. At the moment they are calling it Haywain as they are maturing the cheese in hay. It’s the cheesemakers way of re-introducing the terroir back into the cheese after the milk has been pasteurised. The cheese itself is creamy with lovely grassy undertones and it’s fast becoming one of our favourites here in the shop. Ali went to the Spring Fair at the NEC last week on the look out for Christmas items. We only have a small space for giftware so it’s really important that we fill it with the right things. She came back with some fabulous ideas which I’m really looking forward to seeing. We are also about to start stocking locally made pottery which will be fab. I am so not artistic in any way shape or form so am always blown away by the wonderful things people can create. I’m also hoping that we are going to be able to start selling our own range of giftware soon…watch this space! On a personal front it’s been a tough couple of weeks as my grandmother passed away at the beginning of February. She was a truly inspirational lady and if I ever needed to talk things over with someone she was always my first call. When I let her know that Ali and I had bought a cheese shop the only thing she said to me was “Retail is in your genes so I have every confidence that you will be a natural behind the cheese counter”. I have never met anyone who was as intelligent as she was and as quick witted and I will miss her. I’ve been asked a couple of times recently how I got into cheese and what I do outside of the shop. To cut a long story short, I don’t eat cake but I love cheese and so when we got married a cheese wedding cake was the obvious solution. We did some research and the Pangbourne Cheese Shop was the closet place to us that could supply the cake. We then used to pop into the shop every now and then to buy some great cheese as a treat. On one visit Angela mentioned that the shop was going to be sold and we thought we’d jump in! (I’m a complete risk taker and very impulsive but it turned out to be one of the best decisions we’d ever made - the very best decision was when i got down on one knee and proposed but that’s a whole different story!) Since then I have completely immersed myself in the world of cheese and I’ve read every cheese book that I could lay my hands on, I’ve been on courses, attended lectures and studied very aspect of cheese. I still love to research new cheeses and I can bore people to tears with fascinating cheesy facts. Cheese is the ultimate food source: it is high in protein, calcium and vitamin B-12 (which is crucial for vegetarians like me), it’s great for your gut and it tastes delicious! Whenever i look at our counter it still amazes me that you can take a raw product of milk and turn it into all the different cheeses that we sell. It truly is an incredible product and I feel so honoured to be able to work with it every day. So that’s how I got into cheese 😀. As for what I do when I’m not in the shop… I do live cheese and so I spend a lot of time researching cheese as well as travelling around meeting cheesemakers, visiting other cheesemongers and taking in as much information as I can. In my ‘free’ time I am generally either in the gym, out running, supporting my football team or in my local school where I am Chair of Governors. There’s not really much space for down time but I thrive on being busy and I love every moment of every day. But enough about that, what’s new in Pangbourne…? We have been showcasing some guest cheeses over the last few weeks. 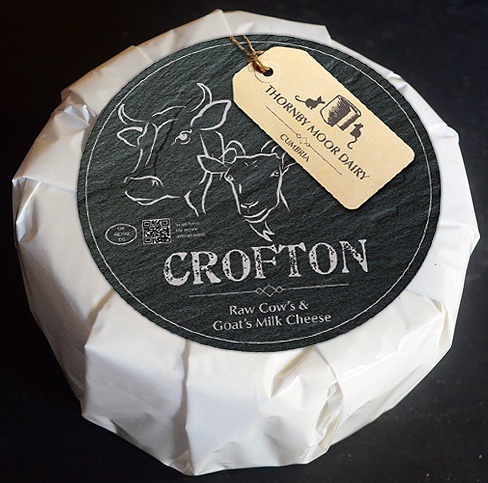 They come into our counter of a week or so and once they’re gone, they’re gone (unless I manage to find a little spot to make them permanent…) One of our guests has been a cheese called Crofton. This gorgeous cheese is a blend of cow and goats’ milk which gives it a unique taste and texture. We’ve also had some Shipston Blue in which is a blue cheese made from Buffalo milk. It’s very creamy with a really nice deep blue flavour. I’m hoping to incorporate a guest cheese spot in the counter so that our lovely customers can easily see what we’re showcasing. On the other side of the shop we have introduced some new nibbles - chorizo thins & duck fritons. They are made in Berkshire and are designed to go with wines & beers. They are incredibly moreish and they’ve proved to be very popular. We’re hoping that their creator, Alun, will come into the shop and do some tasting on a Saturday within the next few weeks. Lastly, I can only apologise to those of you who are unfortunate enough to live on my running route... I’ve been testing out my ankle and have hit the streets of Pangbourne. I don’t run very far, or very fast, but it’s all going really well 😀 Having my ankle fused last year was a testing time but it has turned out to be the right decision and I’m so chuffed with how it’s coping with the increased mileage that I’m putting in. If you do see me out on a run do worry if I look like I’m about to keel over but I am actually enjoying it and every step is a triumph 👍🏻. The last few weeks has seen a warm front covering most of the UK. Whilst we all love the warm weather it has proven to be a bit tricky at times here in the shop… One of our display fridges decided that it was having to work far too hard (even with the air con on) and with a bit of a grunt and a lot of burning smells, its motor ground to a halt. Luckily we were in the shop at the time and so could move all of the cheeses out of the fridge and find homes for them. I hate to think what we would have found if it had happened overnight but the cheese gods were looking out for us and all the cheese was kept cold :-) We are also very lucky in that we have an excellent fridge repair team who generally respond within hours and they came out to assess things. Unfortunately it was a bigger issue than they first thought and so it took a few days to get the replacement parts but all was eventually restored! Our wonderful customers were hugely understanding of the situation and our brilliant staff took all the cheese movements in their stride. But what news from here… We have added anther cheese to our counter in the shape of Sparkenhoe Blue. We often get asked for unpasteurised British blue cheeses and the Sparkenhoe Blue fits the bill perfectly. It is made in the heart of Stilton country, creamy in texture and subtly flavoured with blue mould. It has fast become a favourite with all of us here. I am constantly wiggling our cheeses around in the counter with the hope that I can create space for another as although I am so proud of the range of cheeses that we offer, I would always like to add more. There are 1000s of delicious cheeses out there and we only get to experience such a few of them. The fabulous range of cheeses that we offer is what makes our shop so very unique! Things here in sunny Pangbourne have been as hectic as ever! It's the end of a school term and so we've been busy creating bespoke gifts for some lucky teachers. These have ranged from a mini waxed cheese on a cheeseboard to a hamper full of goodies. When I worked in schools in the dim and distant past I never received anything as tasty! We also make up picnics for customers and this is the definite time of year for them to come into their own. They are always popular at school sports days as well as days out at Henley or Ascot! We've also recently had a bit of a change in our staffing structure with Jan taking on more regular hours and Chris doubling her days to work Fridays as well as Saturdays. It's meant that I'm in less often on a Saturday but that has allowed me to get out and do more village fairs and other events outside of the shop. We've been trying really hard to get the shop more well known locally as well as further afield and going to shows really helps. I just love talking to people about cheese and so am always happy to witter on about it! We have just come back from a week in Devon. Ali and I loaded up our trusty Defender with kids, dogs & walking shoes and headed to East Devon. We had a great time walking along the coast path as well as a couple of hikes inland. The dogs were suitably worn out each evening whilst the kids kept Ali and I in shape. As ever, I can't go anywhere without heading to visit a cheesemaker so I dragged everyone to visit Home Farm, it is here that the Quickes family have been making award-winning cheddar for generations. We don't stock the Quickes Cheddar - it's a matter of room in our counter - but their vintage is one of my favourites. We do have their cheddar truckles available with a few days notice and these are 1.8kg of deliciousness! Mary Quicke is one of the board members at the Academy of Cheese and has been instrumental in championing cheese as a credible, exciting and respected profession. Whenever I tell people that I am a cheesemonger I always get some blank looks but once I explain what I do people are always fascinated. Cheese is such an amazing product - it blows my mind that the same base element of milk can be nurtured and moulded into so many different amazing tastes. It is truly a thing of beauty! It's been another very busy month here in the shop with all sorts of new products and events going on. It always amazes me when I sit down (or stand as I am today) to update my blog that such a long time has passed since my last post. There quite simply aren't enough hours in the day for me to be able to write more often - even though I'm up at 5.15 every morning! So, what's new here? We have been expanding our range of goats' cheeses that we stock with a lovely, award-winning goat brie and a delicious goat gouda. 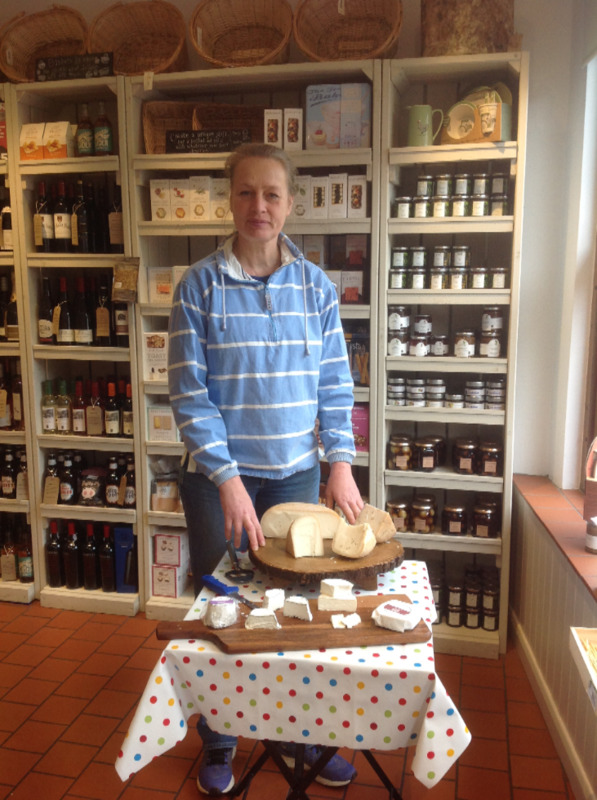 We launched the goat brie last weekend with Margaretha (its maker) coming in to talk to our customers and to offer them samples of her various cheeses. 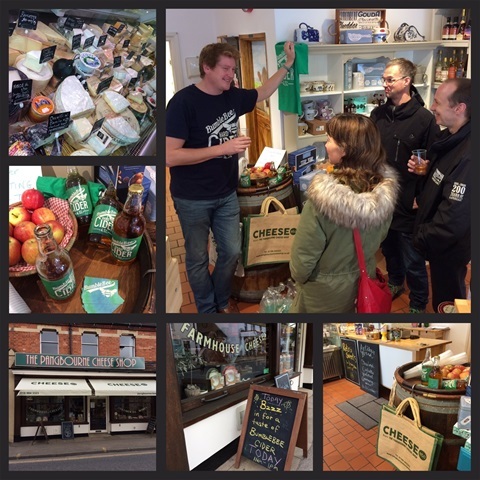 It was a fabulous day and all of the cheeses were very popular with our staff and customers alike. We've also got a lovely new mini Epoisses style cheese called Trou du Cru. It's not a very big cheese but it definitely packs a punch! The cheese is washed with Marc de Bourgogne (a French brandy) Our last addition (which hasn't actually arrived but it's due here today...!) is a larger version of the Rambol that we stock. Rambol is a very soft cheese with chopped walnuts inside and walnut halves on its top. We currently sell individual cheeses which are 125g but I'm expecting a 2kg cheese to appear at any moment. We get asked for this cheese a lot so I'm hoping it will be popular. I recently ran an evening with Laithwaites Wines showcasing their wines with our cheeses. It was a well-attended event and we are hoping to run some other events with them. Our shop isn't hugely suited for running events as we don't really have a lot of space for people to sit and taste cheeses alongside other produce, so it was really great to be able to share a space with Laithwaites. They have a large events room with plenty of tables and chairs as well as a kitchen area, so it was a perfect venue. Keep an eye on our Facebook and Twitter pages for info with regards to other events. Away from the shop my running is still going very well. I did a 12k a few days ago (it was my birthday, so I treated myself!) and I followed it up by doing a 10k the day after...there's been no pain or stiffness at all which is such a relief. I definitely couldn't cope with another stint on crutches! It's been a little while since my last post but things here in Pangbourne are are as lovely as ever. Easter is generally a busy time of year for us and this year has been no exception. We've been filling the counter and the shop with loads of goodies and it's all looking really fab! 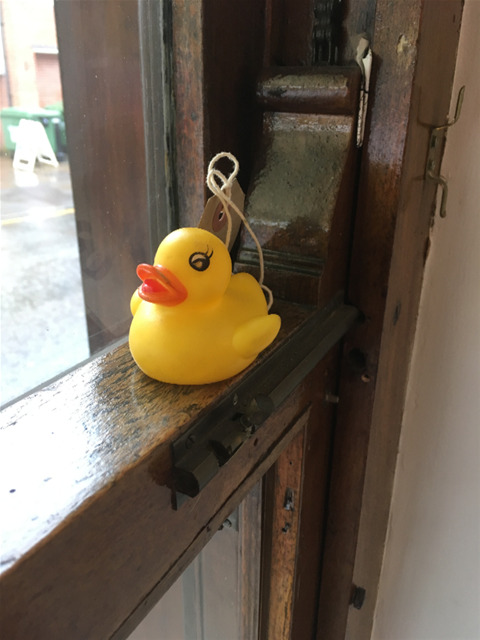 Pangbourne village doesn’t go in for a large scale Easter Egg hunt but all of the shops display ducks which the local playgroup brings round. The kids have to go through the village and write down the ducks' locations. It's great fun watching them point excitedly through the windows. We're going to be opening on Good Friday for the first time this year. Just a short day, 9-12, but hopefully long enough to satisfy our customers' cheesey needs! It's normal hours on Saturday before we have a couple of days off, and then back on Tuesday. We've recently started selling bread every day which is delivered to us daily from the Honesty Bakery in Newbury. It's proven to be extremely popular and their hot cross buns are (apparently) to die for! We are still doing our sourdough breads from Degustibus at the weekend. It's just a shame I don't eat bread! So what else has been happening in the shop? We've got a couple of delicious new cheeses in our counter. The Smoked Lancashire is looking fabulous and we're got a beautiful Appenzeller. I'm still sticking to my Lent challenge and so I haven't tried either of them yet... Thankfully there’s only 3 more days to go! It hasn't been as hard as I thought it would be but I wouldn't want to abstain from cheese for much longer! We have just had a couple of days in Berlin and whilst there wasn't much cheese on the menu - we could only find one specialty cheese shop - we had a great time seeing the sights. It is an amazing city with an incredible history and it was fascinating wandering around and taking it all in. 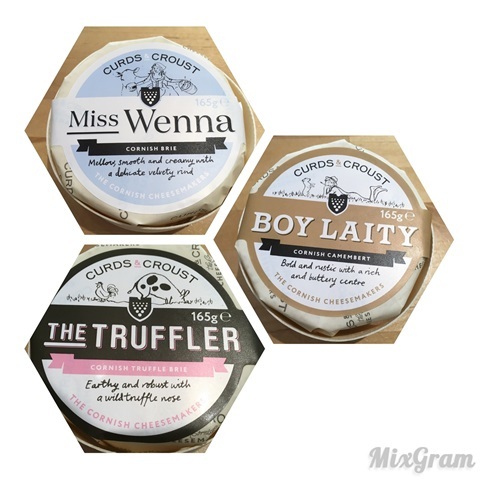 We are hoping to get over to the Netherlands in the spring to visit our Gouda makers and we've been invited to Le Gruyere to see their unique production so hopefully there will be lots to report on in the coming months. On a real positive personal front, my running is improving all the time :-) I did a heavy week last week (60km) and so am on an easier one at the moment but I’m so chuffed with how it is going and with no pain at all in my ankle, happy days! As we see out the last trading day of 2017 it’s time to reflect on the year that’s been. Here in Pangbourne it’s been a year of successes. We are all still so proud to have won the Cheese Counter of the Year and our counter remains, as ever, the focus of our shop. We’ve also launched our new online presence which is going from strength to strength. We haven’t publicised it at all (apart from my witterings online) yet we had several orders to add into the Christmas mayhem. It continues to grow and our cheese selection online is second to none. On a staffing front, Angela celebrated her 10yr anniversary as our shop manager whilst Jo has cut back on her hours. We have a new member of staff, Chris, who has settled in so quickly that it feels as though she’s been here forever. Our Saturday shoppers will get to know her more as the weeks pass. We also had extra help over the festive period with Jan and Jonny coming in to help out, so the whole gang has been involved over the last few weeks. Ali and I are planning a few trips in January to visit some of our cheesemakers - I’m keen to spend a couple of days in Stilton country so hopefully we can set that up whilst things are a bit quieter. We are also looking to expand our Welsh Cheese selection so a trip over the Severn is called for. We’ve been invited to visit our Gouda suppliers in the Netherlands as well as going to Switzerland to see Le Gruyere being made. It’s going to be a busy few weeks! On a personal front I’ve pretty much recovered from my ankle surgery. I suffered from quite a bit of swelling over Christmas but I put that down to being on my feet for 20 hour days! I’m back running :-) I had set myself the target of running a 10k (albeit on a treadmill) before the end of the year and I nailed that a couple of days ago. I’m loving being back pounding out the kilometres, although I’m doing my best to be ultra careful. Lastly we would all like to thank you for your support over the last 12 months. Without our customers our shop is redundant so we are eternally grateful that you choose to shop with us. 2018 is going to be an interesting year from a retailing perspective so thank you for continuning to visit local, independent traders. The main addition to the shop this month has been our brilliant local gin! Twisting Spirits is distilled just near Goring and so the gin travels less than 10 miles to get to us. There are three flavours - Kaffir Lime, Douglas Fir & Earl Grey. Everyone that has tasted it in the shop loves it and it's flying off our shelves. Why not pop into the shop and see which of the three takes your fancy? We’re heading towards our busiest time of year in the shop and so the whole team have been hard at work. We spend a great deal of time in researching the products we will stock at Christmas and it’s always very hard to choose items that we will think will be popular. We don’t have much storage space and so it’s a question of buying in enough stock but not so much that we can’t fit it in the shop. It’s then a waiting game to see if our customers like the lines we have. I’m no good at any of the decorative things (I leave all of that to Ali & Angela) so my job is to look at all the cheeses from all of our cheesemakers and wholesalers and choose what we should have in and how much of each cheese to pre-order. It’s my favourite part of the festive preparation. I go all out to source new little cheeseboard cheeses at the best price I can so that our customers can have the most amazing selections. I’ve been dealing with a couple of new suppliers over the last few weeks and have made a switch with regards to some of our continental cheeses. For me it’s all about getting the best cheese I can and I do like to drive a hard bargain! The cheese that I’m most looking forward to getting in is a fabulous Beaufort. This is an alpine cheese, made exclusively in the Savoie region of the French Alps. Legend has it that the production of it dates back to 121 BC when the Romans were occupying France - I’m hoping the one we’re getting in isn’t quite that old…! We've also got the lovely Vacherin in store at the moment, it's worth the 7 month wait to get it back in stock as it is always such a great treat. We have a Christmas Order form in store (and I can email out copies if you need one - just let me know at info@cheese-etc.co.uk) and it’s always a good idea to fill one out and let us prepare your cheese ready for collection. Favourites such as Barkham Blue sell out very quickly and once it’s gone, it’s gone. Priority goes to customers who have put in an early request. We will always have cheese in our counter but if there is a particular cheese that makes your Christmas special then please do let us know to reserve it for you. Equally if we don’t have a particular cheese on offer then let us know and I will do everything I can to get it. As well as all of our cheeses, crackers and chutneys, Clare (our fabulous cake maker) has great range of locally homemade Christmas cakes & puddings available to order - her cakes are absolutely delicious and always very popular! It's definitely starting to feel a lot like Christmas! Last Saturday was our two year anniversary here in the shop. It’s been the most amazing couple of years and we have truly loved every minute of it. The shop has evolved since we took over as we’ve slowly made it our own. Some bits have taken longer than others and the re-branding (which has just been completed) was the final piece of the jigsaw. But somethings don’t change and our cheese counters remain at the heart of everything we do. In the last two years we have expanded our cheese selection and we have a cheese counter which rivals that of any retailer. I love it when people come into the shop and are blown away by our selection. We are constantly out scouting for new additions to our counter but we are limited as to what we can stock due to space! I’d love to enlarge the counter and have more cheeses but, for now, I have to settle on the 120+ that we have. Although I do manage to squeeze a new one (or two) in every so often which is why I’m pleased to be able to report that we have the brilliant St Bartholomew back in stock. This is a totally organic, hard cheese made in Nettlebed which is a mere 7 miles from our base camp. I’ve also found a gorgeous young Gouda which is so savoury it’s a delight to nibble on - Bon Repas (which translates as ‘good meal’ in French) is a farmhouse cheese with an exceptionally creamy texture and it complements our other Goudas superbly. So what’s been happening in beautiful Pangbourne? We were sent some wonderful cheesy sables which went down a storm with all of us in the shop so an order has been placed and they will soon be gracing our shelves. Every single item in our shop has been tasted by us and our staff, we all have to agree one which new lines to stock so you can be assured that everything we sell goes through a rigorous audition! As well as these fab savoury biscuits we’ve also got some amazing new gin in. 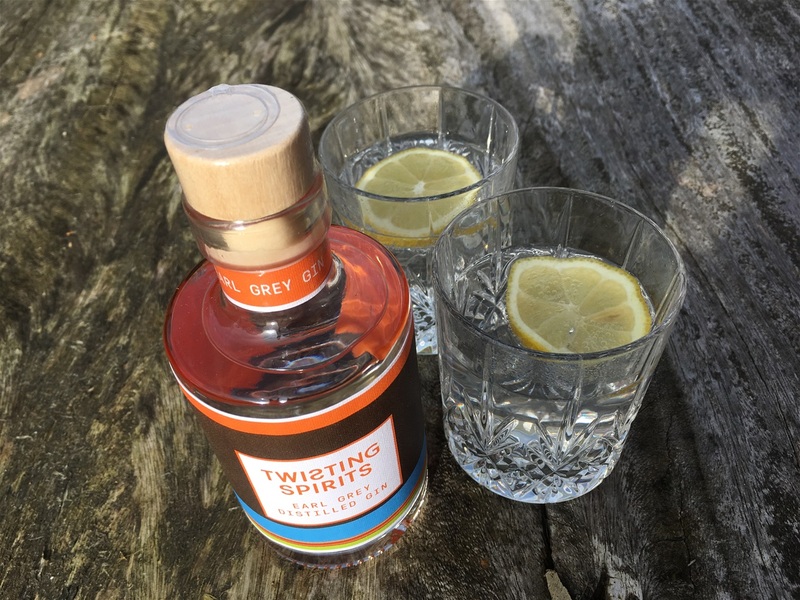 Distilled less than 10 miles from Pangbourne, using locally sourced ingredients, Twisting Spirits have only been in production for a few months but they are simply delicious. We’ve even got a bottle of the Kaffir Lime one on taste :-) happy days! Away from the shop I’ve been mostly cutting hedges… We live on a smallholding which is immensely lovely but it does involve a fair amount of work. Luckily we have some wonderful people who rent our fields for their horses so they tend to a lot of our land but there are still plenty of jobs that Ali and I have to manage. We have a couple of hundred metres of laurel hedging which needs tidying up every now and then and now is that time. I do love doing it all but it is pretty back breaking work so I’m always glad when it’s Monday morning and I can go into the shop for a rest! It's been so manically busy here that the last couple of months have absolutely flown by! Things in lovely Pangbourne are as hectic as ever with new produce coming in and a whole new image for the shop :-) We've re-branded which has meant new everything from business cards right up to a new sign outside. Along with the new bollards that the council installed recently, the exterior of our little empire has changed dramatically. But, more importantly, what cheese news do we have...? After many requests we've decided to get some new cheeses in (and some old favourites) so I'm on the look out for a different Gouda. We currently sell 4 different Goudas (ones flavoured with Cumin, Truffle & Fenugreek, as well as our 1000 day cheese) but I'm thinking that we need a good, everyday one. 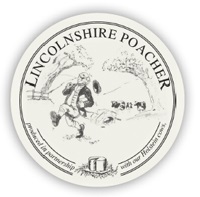 I'm planning on asking our wonderful Dutch cheese supplier to give me his recommendations (and hopefully some samples...) We have also decided to bring Lincolnshire Poacher back into the counter after a few months away. This has been largely prompted by some market research that I've been sneakily carrying out. I've always been a fan of the Poacher and so have made space in the counter! We are also asking our wonderful customers to let us know what cheeses they'd like to see in the counter... tweet or facebook us with your requests and we will choose some guest cheeses between now and the end of the year. It's been a busy few weeks in the shop so I haven't found any time to be able to blog recently in spite of still being fairly immobile! Ali has been an absolute angel in running me around everywhere I've needed to go and I know she'll be as relieved as I am when I'm allowed to walk again. My tag of the Running Cheesemaker has had to be put on pause whilst I've been recovering from the surgery but I am determined to be able to get back to running as soon as I can. My netball career is over though as that's one sport which has been vetoed by the surgeon. I'll still be involved with my team on the sidelines but I'll definitely miss being on court. But the positive news is that I go back to for x-rays next week and as long as the bones have all fused correctly then I'll be allowed to put weight through the joint again. It's been a long few weeks and the last two have definitely crawled along but the end is now hopefully in sight. So what cheesy news from us in Pangbourne...? Last week Ali and I went along to the Guild of Fine Food's new London office in Borough, which is a fabulous space (and available for hire I'm led to believe...). They were hosting an Academy of Cheese training session for cheesemongers. The Academy of Cheese is a new organisation which is the brain child of a group of cheese enthusiasts led by the queen of cheese herself, Mary Quicke. It is designed to establish an educational programme to promote cheese and to create a Master of Cheese award. The day ended with us sitting an exam to gain our level 1 accreditation. Luckily we both passed the exam first time otherwise it would have been exceedingly embarrassing! Our new website is also starting to take shape and we're hoping that it will go live in the next week or so. We've been taking multiple photos of the shop as well as taking individual shots of each and every cheese...which at 120+ cheeses takes a while! It's looking good though and we're very excited about customers being able to buy great cheese online. The sun is shining and the British countryside around us here in Pangbourne is looking particularly spectacular 😀 It's been almost 4 weeks since the op and on the whole things haven't been too bad... I've been using an amazing contraption called an iWalk which you kneel on and it allows you to walk around without the use of crutches. This has meant that I've been in the shop and working as much as possible. I'm having to rely on Ali to drive me everywhere and this has meant that occasionally it's not been practical to get in to work but we're getting there! The plaster cast comes off in a couple of days and then I've got 6 weeks in a protective boot. At least that one will be removable and so a bit more comfortable in this heat! So what's been going on since my last update? 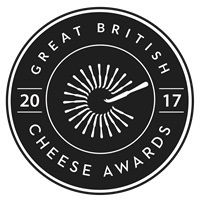 The British Cheese Awards are always announced near the beginning of June and this year the Supreme Champion was a delightful little sheep's milk cheese, Pave Coble. This cheese is made down in Somerset in one of our favourite dairies, White Lake. Pete and Roger make many of the goat's cheeses that we stock, as well as a couple of our washed rind cheeses. One of these, Sheep Rustler, also won the Best Modern Cheese. Their cheese is always a hit with our customers and when we tried the Pave last year we couldn't wait to get it in. I'm looking forward to going down there in a couple of weeks to see the trophies! 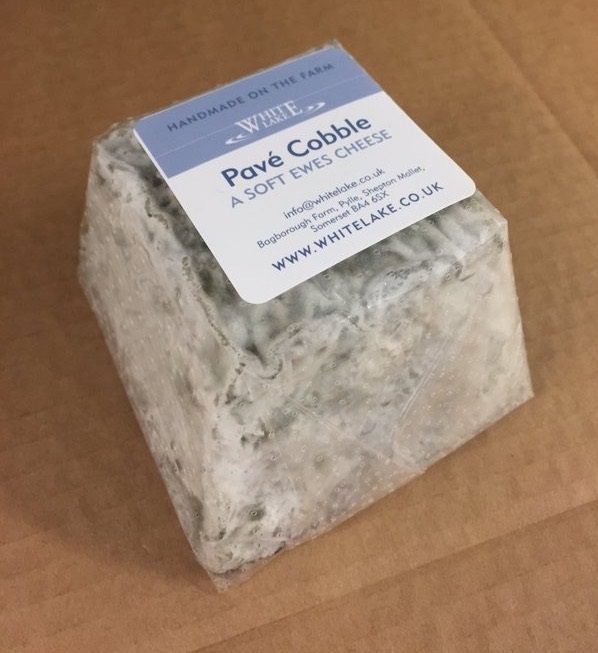 On top of these White Lake winners, we also stock the Best Blue - Cropwell Bishop's Beauvale - as well as the Best Cheddar - Westcombe - and the Best Packaged - Godminster. Behind the scenes Ali and I have been working hard on a new logo and website. We've wanted to update ours for a while and as I've got a lot more free time (not spending 3 hours a day in the gym creates almost an extra day in my week!) we figured now was a good time. Hopefully that will be ready to go live in the next couple of weeks. So all in all things here have been good, let's just hope this fine weather continues for all the school sports days as well as Ascot, Henley, Wimbledon... We supply picnic hampers and lots of our customers have pre-ordered theirs in anticipation of outdoor dining! I'm 6 days post-op and so thought I'd utilise my time by updating my blog! I know it's been a couple of months but we've been so busy in the shop and then I've been manic at home trying to prepare for 10 weeks on crutches! As any keep fit fanatic will know the prospect of at least 10 weeks (if not longer) out of action is fairly terrifying so I spent my last week of freedom clocking up the miles in the gym - I think my 84k week is probably my highest total of my fairly short running career. I've been advised that I may not be able to run again once the ankle is all healed but never one for heeding advice I'm going to endeavour to get back into the swing of things as soon as I can! But hey ho, life goes on and I've spent the last few days writing notes on all of the 120 or so cheeses that we stock in the shop... it's been really interesting picturing our cheese counter in my head and making sure that I've covered all of the cheese that we stock. I don't think I've missed any out but time will tell! So what's been happening in the world of Pangbourne Cheese...? 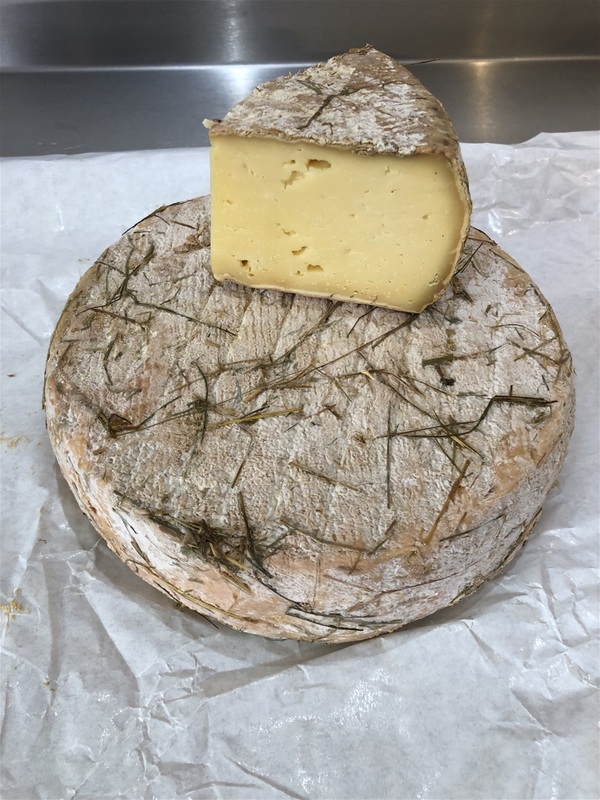 We've recently teamed up with a new cheese supplier - Beillevaire - and are very excited about some of the new cheeses this means we can offer to our customers. Beillevaire are a small, family run, cheesemaker with little dairies scattered throughout France, allowing them to produce different AOC restricted cheeses. We received our first delivery from them this week (I was gutted as I was on house-rest and so couldn't be in the shop to see it) and their cheeses have all gone down a storm with our customers. We've gone for a number of small, individually wrapped cheeses which are simply perfect to take out on a picnic or to joy as part of a cheeseboard. When we originally sampled their cheese to decide what to stock my personal favourite was the Chabichou (an exquisite little goats cheese) but I'm very excited to see what our customers think, especially of the Camembert with Truffles...! We are always striving to find the very best cheeses at the very best prices so that we can offer our customers an unrivalled choice at an affordable price. Don't forget it's Father's Day on the 18th June... we have the perfect gifts for that hard to buy for dad! We're also on the look out for someone to come and work in the shop - ideally every Saturday and then some holiday cover. No experience is at all necessary, we will give thorough training, but a love of cheese is a bit of a must! If you know of anyone who might be of interest we'd love to hear from them. And finally... we are just in the process of changing our website and are hoping to be able to launch an online ordering facility. This is very much in the planning stage but I'm hoping it will all be up and running quicker than I am! We've been lucky enough to be able to spend some time in Tokyo over the last few days. The Japanese aren't known for their cheese, either making it or eating it! We weren't able to find any Japanese cheese during our trip but it was lovely to have a few days off before the hectic time ahead. Easter is our 2nd busiest time of year after Christmas. It's a time when families get together and there's no better way to end a family meal than with a cheese board. We get asked time and time again "How do you put together a perfect cheeseboard?" Every one of us in the shop has their own favourite combinations, Ali is a great fan of our local cheeses, Jo will avoid a goaty option and Angela loves the French classics but mine tends to be very traditional selection, albeit a totally English one! For me there are two options for a perfect cheese offering: 4 cheeses (a hard, a soft, a blue & a goat) or simply one statement cheese. In my opinion the best 4 cheeses in our counter at the moment would start with Appleby's Cheshire. This is one of our most overlooked hard cheeses. It is a deliciously moist, crumbly Cheshire with a rich, zesty flavour. Plus it's fabulous colouring makes it a great addition to a cheeseboard. I would then move on to a piece of Baron Bigod. 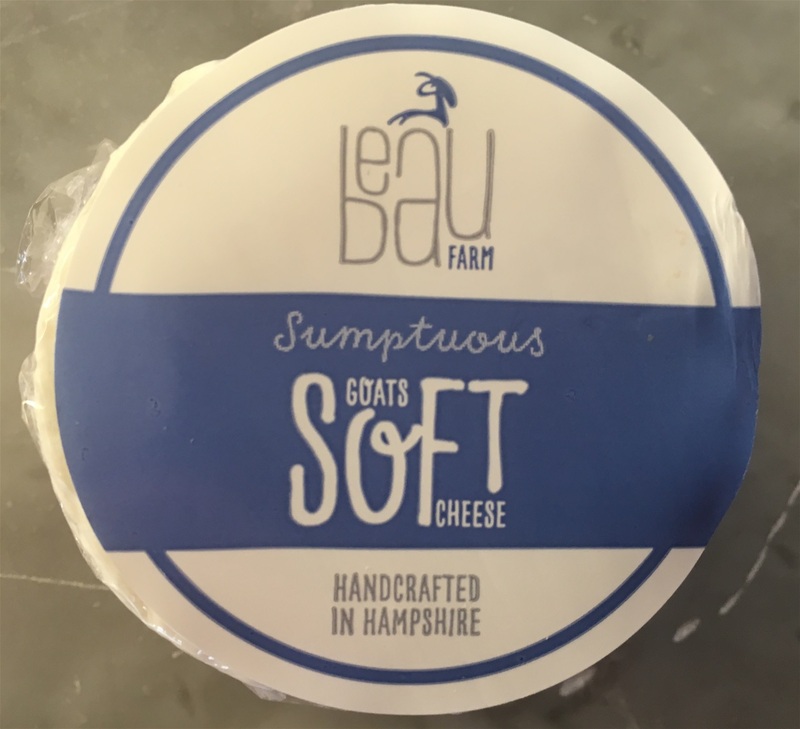 This amazing soft cheese is made on Fen Farm in Suffolk using milk from Montbeliarde cows. It is made in a very similar way to the French Brie de Meaux and the result is a deliciously, tangy, intense soft cheese with a delicate mushroomy taste. Then as far as I'm concerned there is only one option for a blue - Stilton. We stock a Stilton from the smallest creamery which is allowed to make this fine cheese, Colston Bassett Dairy. It is a perfect example of a Stilton, creamy, smooth, rich and flavoursome. Simply delicious. I would finish my cheese plate off with a goat. This is the hardest of all the cheeses to recommend as I'm a huge fan of goats cheeses and it's difficult to narrow it down to one. We have an amazing locally made cheese (Sinodun Hill) and some fabulous examples from Pete Humphries' dairy in Somerset (Nancy & Rachel are my top two from there) but for this combination I am going to go for a Herefordshire cheese, Ragstone. This is a mature goat's cheese and as such it has a strong savoury taste. The flavours and the texture of the cheese compliment each other, creating a perfectly balanced cheese. The alternative option is to go for one large piece of cheese. If I was to choose one cheese from our entire counter to eat it would be Jamie Montgomery's mature Cheddar. For me this cheese represents all the greatness there is in British cheesemaking. Being an artisan cheese it's taste changes slightly with every batch that we taste. 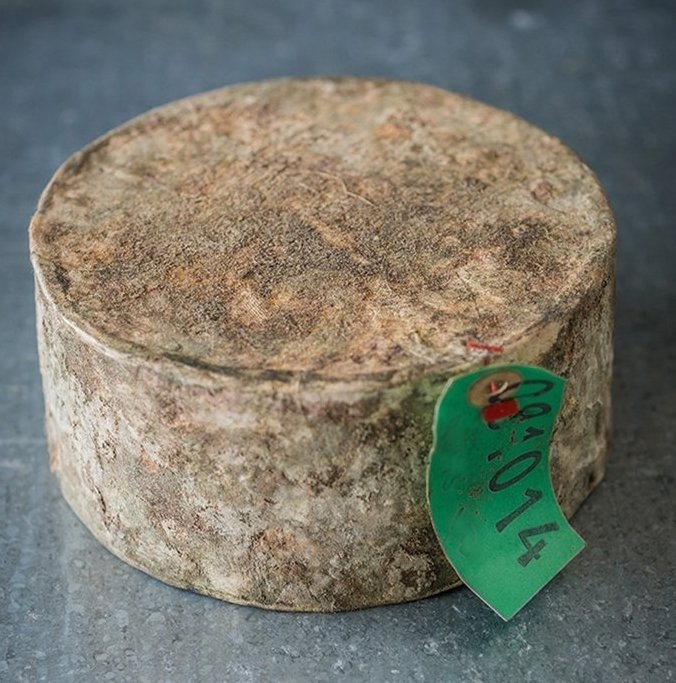 It can also develop a slight blueing near its rind but that just shows that it is a handmade, unpasteurised piece of perfection. Ali and I had a whole disc of Montgomery as the base of our wedding cake. Every time I taste it I am reminded of that day and it fills me with total happiness. So there are my choices for a perfect cheeseboard this Easter. We have so many cheeses in our counter and there are endless combinations you could have. All you need then is a piece of our 6 day sourdough bread, coupled alongside some onion chutney and you got a piece of culinary heaven! Finally all that is left is for me to wish all of our customers a happy Easter! We've had a busy few weeks here in the shop since my last post. 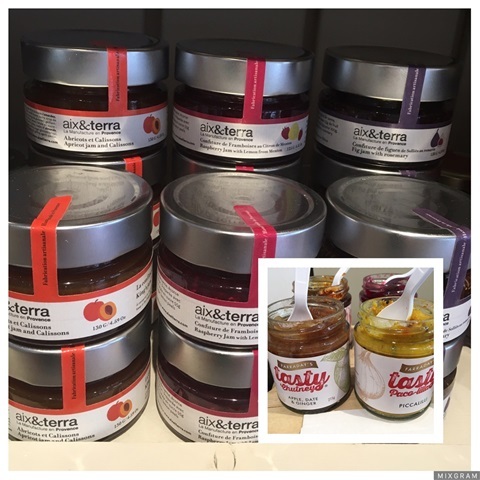 New suppliers have been in and, after consulting with our customers, we're stocking a few new lines :-) We do try as far as we can to get our customers to taste new products and compare them against existing items. This means we can give consumer led feedback to potential suppliers and it gives our customers a personal stake in the shop. We are so lucky here in Pangbourne to have such lovely people shopping in our store and we endeavour to stock the best items at the best prices that we can. We are currently stocking 2 new ranges - one from the Lake District and one from France! The English Faradays Tasty chutneys have been a great success and they sit really well alongside our other chutneys. At the moment the piccalilli is a definite customer favourite although the chilli & tomato jam is giving it a run for its money. The French aix & terra products are adding a continental flavour to our jam offerings. The fig jam with rosemary is simply amazing :-) We've got all of these new products on taste in the shop so pop in and ask for a sample. We love people to try before they buy. 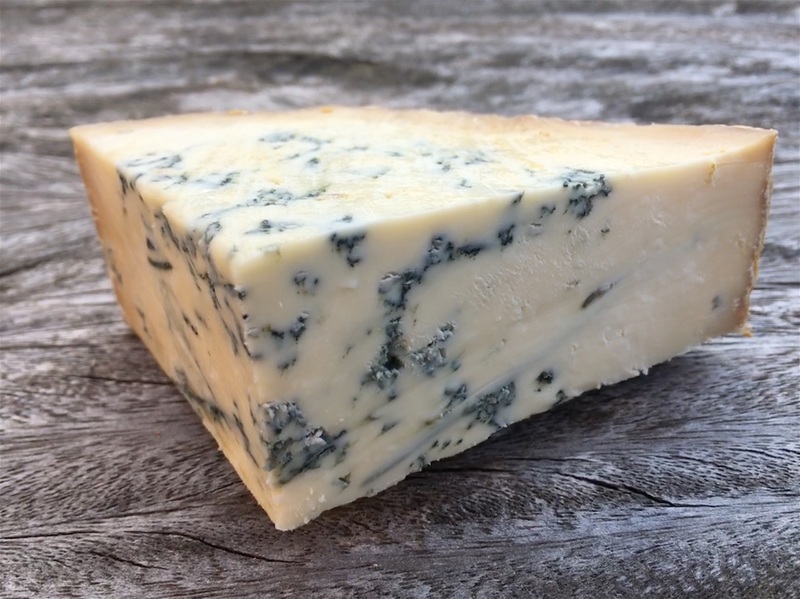 On the cheese front we have been adding to our 'blue' range and we currently have a fabulous Blue Shropshire in the counter. It is made at the Cropwell Bishop Creamery and it won the supreme champion accolade at last year's British Cheese awards. We even had a bride and groom choose it as the base layer for their cheese wedding cake. It adds a lovely colour to a cheeseboard as well as a fabulous taste! We're also stocking a very creamy blue made alongside the Shropshire, which is Beauvale. This is a much younger cheese but it still retains that classic stilton-esque taste. I'm trying to juggle a visit to Stilton country, not only to visit Cropwell Bishop but also to pop into the smallest Stilton maker, Colston Bassett Dairy. We stock their traditional Stilton and it is always brilliant! This weekend is going to be a busy one with Ali heading to the Bucklebury Artisan market with a selection of our local cheeses for people to sample and buy whereas I'm off to Shaw House in Newbury on Sunday to set up at their spring fair. I'll also be in the shop on Saturday (but I love being at work so that's not really a hardship!). So if you're out and about at the weekend why not head to Pangbourne, Newbury or Bucklebury village for your cheese selection. So far 2017 has been all about celebration cheese cakes. Whether it's for a wedding, birthday, christening or just a party the must have dessert option is a cheese cake! We've seen a big increase in enquires and have had lots of lovely customers coming into the shop for cheese tasting. 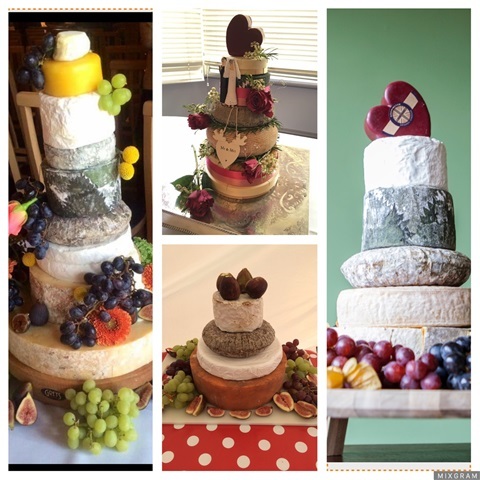 We are always keen for people to come in and taste any of our 130+ cheeses so that their cake is totally unique and bespoke to them. Ali and I had a cheese cake at our wedding - I don't eat cake or any type of dessert (apart from fruit) so a cheese cake was the obvious solution. It also ultimately led to us running the cheese shop but that's a whole other story! So what makes a good cheese cake? (Although in our opinion any cheese cake is a good cheese cake...!) Rather like a traditional tiered cake you want to start off with a large base and add smaller tiers on top. Soft cheeses can make a great bottom tier as they often come in a box and so can withstand the weight of the cheese. They also work in the middle of the cake to add a bit of support. A popular base with our customers is also a Cornish Yarg. It just looks so attractive in a cake with its fabulous nettle covering. Our Aged Red Leicester works well and gives another splash of colour. A ring of Colston Bassett Stilton is often a favourite along with a Barkham or an Oxford Blue. But each and every cake is special and totally bespoke. Our own wedding cake was incredibly indulgent and was a huge hit with our friends and family. Amazingly not all of it was eaten on the day so we froze some pieces (yes you can freeze cheese) and we enjoyed them on our first anniversary. We went for a whole round of Montgomery Cheddar, a ring of Colston Bassett Stilton, 2 Wigmore, a Barkham Blue, a baby Cornish Yarg, an Oxford Blue, a Delice des Cremiers, a smoked Snowdonia Cheddar & a Crottin. 9 amazing cheeses, all with their unique taste! This week we've also had a run on Scottish cheese with Burns' night dinners in full flow. There are some fabulous cheeses made north of the border and we're lucky to have an excellent supplier based in Dunfermline who sources us amazing products. The Caboc is a personal favourite of mine alongside the excellent Barwheys Cheddar which also happens to be made in the same village where Robert Burns' mother was born. 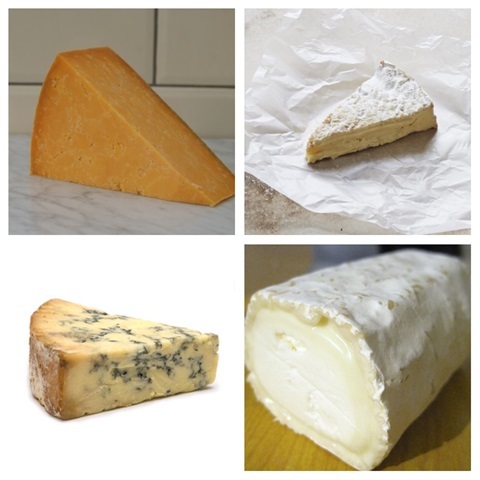 Why not pop down to Pangbourne and check out our cheeses for yourself? 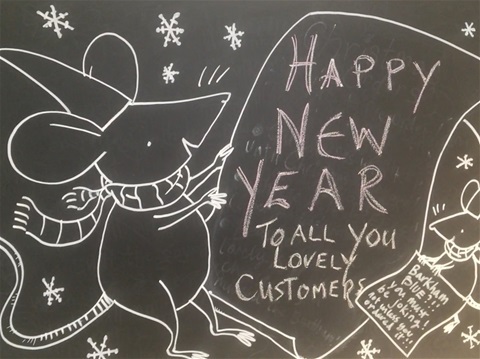 Apologies for the lack of blogging action recently but Christmas in retail is a hugely busy time of year and we've had all hands to the cheese in the festive build up. We're really luck in the shop in that we have two fabulous members of staff who work as and when they're needed. Jonny and Jan fit seamlessly into the established team and we all have great fun even when the queues are out of the door. We're also very fortunate that our two kids are equally happy to step up to the plate. This year saw Steffan mainly on domestic duties with dog walking and pig feeding featuring on his agenda whilst Tara has been an angel in the shop running to and from our refrigerated van with customer orders as well as restocking shelves. She also makes a wicked cup of tea which is one of my particular requirements! All in all it's a well oiled machine and hopefully all of our customers were happy with their Christmas cheese. We routinely sell out of cheesy favourites at this time of year with out fabulous local cheeses being the first to go. We were lucky to be able to fulfil pre-orders of Barkham Blue, Sinodun Hill, Waterloo, Wigmore & Bix. Our Christmas order forms are generally available by the beginning of November and all of our local customers know they need to get their orders in early. Hopefully we'll be taking online orders next time around....watch this space! Ali and I always try to go away as soon as the shop shuts for Christmas and this year was no different. We left Angela and Jo to open up for those all important post Christmas orders and jetted off to India. 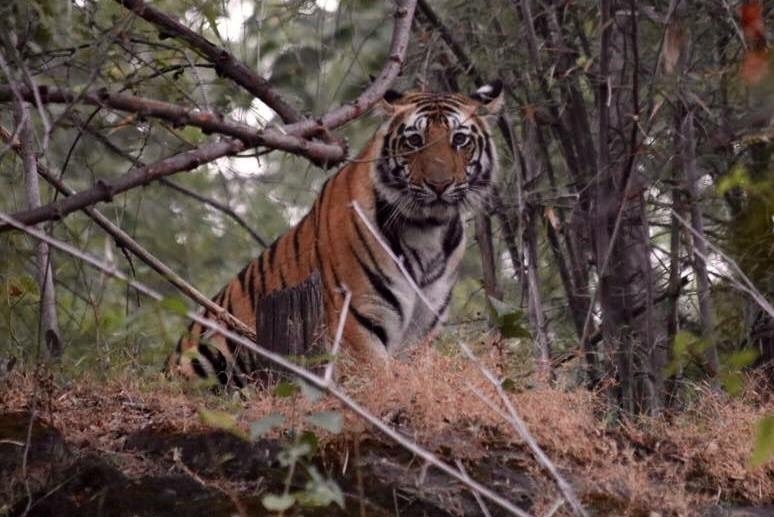 I must say it wasn't the most relaxing of trips with a packed schedule crammed in but for me, the highlight of the week was seeing Tigers out in the wild. They are truly majestic creatures and I feel so privileged to witnessed them. From a research point of view the trip was a bit of a write off as the Indians aren't known for their cheesemaking and the cheese marked 'Emmental' that I tried in one hotel was distinctly Brie like in taste and texture! The locals informed me that nearly all of their cheese is imported in spite of a healthy milk production. A lot of the milk goes to make yoghurt which I guess goes better with curry! So what to expect from us in 2017? There are already plans underway to add to our range in the cheese counter. There are a couple of new local cheesemakers I'm heading off to meet so I'll be reporting back with any new additions. Our lunchtime fare will start up again this week with soup back in the cauldron and of course our famous cheese rolls will be available. Jan, our resident artist, has produced some fabulous sketches which are in the process of being turned into prints for the wall and lastly we're hoping to team up with our local wine supplier to do some cheese and wine evenings. All info will be published on our twitter and Facebook pages. I'd like to thank all of our customers for their support over the last year and here's to a very wonderful 2017! 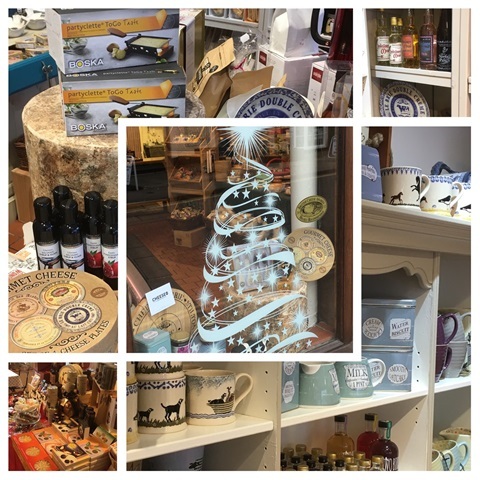 The silly season is almost upon us and here in the shop we are in the midst of Christmas mayhem 😀 Cheese and Christmas seem to go hand in hand with each other. Last year was Ali and my first experience of the retail world at Christmas and with a lot of expert guidance from our brilliant team here, we got through it unscathed! This year is almost more daunting as we know what to expect but I'm definitely looking forward to it. I thrive on being busy and I love it when the shop is buzzing. My running also increases as we get busier as I use it as a way to unwind at the end of the day, all in all it's a great time of year. So why is cheese such an integral part of Christmas? It's a time of year when homes are traditionally filled with friends and family and cheese is such a good thing to have to eat at a party. Whether you like a hard cheese, a soft, a blue or a flavoured one there is always a cheese for everyone. It is also a relatively cheap way to feed a lot of people, and it keeps well so you can keep bringing out the cheese throughout the party season. When I was a kid my dad would always bring home a 2kg Stilton. He and I were the only two in our household that ate it and so the top would get cut off and we would spoon out the cheese as and when we wanted any. If only I'd known then that the rind of the Stilton is by far the best bit! Stilton, Brie and Cheddar are our most popular Christmas cheeses and we're already taking orders for collection during Christmas week. However, for us here in the shop it's not all about the cheese. We stock a great range of gifts which we try to make sure are unusual and unique to us here in Pangbourne. Some of our gifts have a cheesy theme but lots of them are just quirky items that might just suit that hard to buy for relative. We also spend a lot of our time making up bespoke hampers as gifts. It's so cool watching people build up a gift which we then wrap and beautify. We've got some brilliant wines, ciders and beers in, as well as some delicious flavoured vodka. Our mead is popular at this time of yearI spend a lot of time travelling around meeting cheesemakers but I also get to go and visit wine merchants and brewers. Thursday was a hugely significant day for Ali and me as it was the 1st anniversary of us completing on our purchase of the shop. It's been an amazing year, lots of ups, a fair number of downs but I for one wouldn't go back and change it at all. I'm so grateful to our shop manager, Angela, and our 'Saturday girl', Jo, for everything they have taught me, not just about cheese and retail but also about life experiences. We celebrated on Thursday (as only cheesemongers can) by taking everything out of our cheese counters and restocking them in a completely different order. It's always good to have a bit of a mix up, although now our customers don't know where their favourite cheeses are (and neither do we...) It's all looking great and I'm sure it won't take too long to get used to the new layout! We've had some new cider in which has proved to be very popular. James & Tim used to run the Catherine Wheel pub in Goring but have switched to the other side of the bar and are now producing a fabulous cider. Bumble Bee cider is made from Somerset apples and is a bit of a bridge between a traditional scrumpy and a dry cider. It proved very popular over the weekend when the lads came in to do some tastings for our customers! On to the cheeses 🧀🧀 This week has been all about Vacherin. 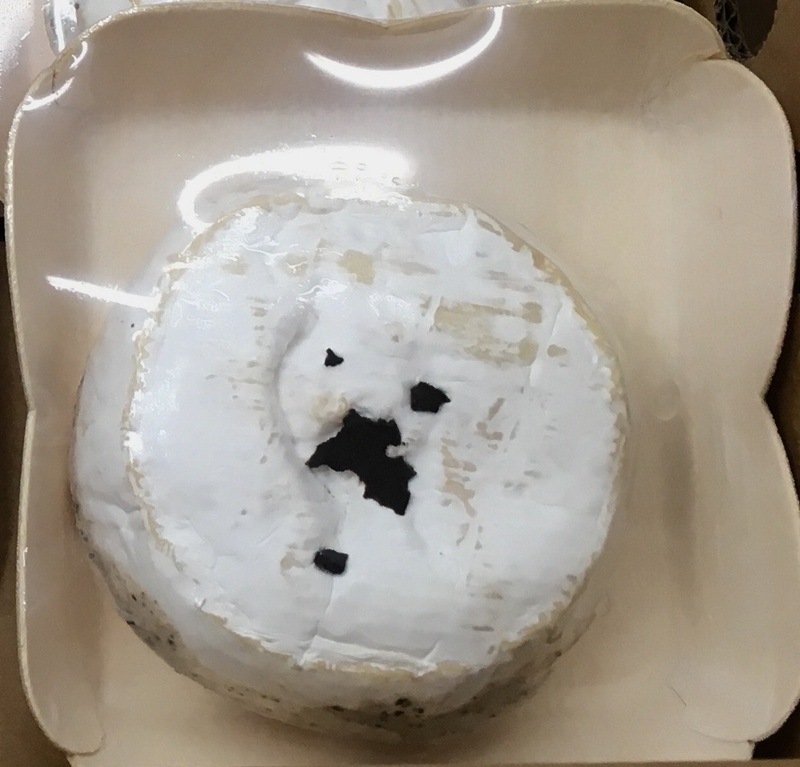 We waited a couple of weeks longer than some other cheesemongers to release our Vacherin as we wanted to make sure it was at its creamiest, runniest best. Ours is the Vacherin Mont d'Or which comes from the Jura region of Switzerland. You can only buy Vacherin between September and March which is when the cows come down from the hills and are kept indoors, being fed hay rather than grass. This change of diet gives the cheese a wonderful sweet flavour. The final cheese then has a band of spruce put around which helps it to maintain its shape as well as allowing the spruce to slowly permeate into the cheese. It is a delicious cheese and we sell both the cutting version and a small whole cheese. The baby Vacherins are perfect for baking, you can then dip warm bread or vegetables into them - it's making me hungry just thinking about it!! We have also just started stocking Barwheys Cheddar which is a delicious, strong Scottish Cheddar made by Tricia Bey at Barwheys Dairy. It's been lovely this week to have a chat with Tricia to get to know more about her dairy. Barwheys Dairy is in Maybole which is where Robert Burns' mother, Agnes, was born and indeed just a short distance from where she made cheese. Amazingly I visit SW Scotland fairly frequently and I have often driven past the end of Tricia's road, equally she knows Pangbourne well as her brother attended Douai Abbey School! Tricia started in 2008 with 2 Ayrshire cows and has built up her herd to 33 cows. She is a small scale cheesemaker, only making her cheddar and a smoked version. Tricia believes that the Ayrshire milk is perfect for cheesemaking as it is so sweet and aromatic. The cheddar is matured for at least 14 months before it is released so the cheese we are currently selling was made from last summer's milk. This gives the cheese its lovely deep yellow colour. It's colour will change as we begin to get in last winter's cheese as the cows aren't out eating the grass for as much of the day but instead are being fed indoors. It's become a permanent member of our cheese counter and we may well try the smoked version too, watch this space! Christmas order forms will be available in the shop from the end of this week so pop in and grab one! This week in the shop has been all about decor... Having got new shelving installed a month ago as well as new awnings and the outside smartened up, we realised that the internal decoration needed doing. So our fabulous decorating team agreed to work nights so that the work could all be done whilst the shop was shut. Two long sessions later and the shop looks amazing! It's so light and feels much bigger - if you haven't been in for a while you'll be amazed by the difference! Regular customers will be pleased to hear that the Moona Lisa is still in situ!! On the domestic front, Ali and I are very lucky to live on a small holding and we keep rare breed pigs. This week has seen the arrival of our pair - Rodney & Dellboy. I had a bit of a shock this morning when I went to feed them as I couldn't see them anywhere in their field... Typical boys, they were both fast asleep in their ark, curled up together in their hay and looking very settled in their new home. So between cheese and pigs this week seems to have flown by. We're off on a field trip this weekend so hopefully there'll be a lot to report back on next week! We've had another brilliantly busy week in the shop although it's always a bit scary at this time of year because we have to order in our Christmas gift stock. I find it very difficult to think what sort of things our customers will want to buy - I'm best left behind the cheese counter whilst Ali, Angela and Jo get stuck into the vast numbers of catalogues that we get sent. Seriously - you do not want me choosing the range...I have no sense of what colours work with what or what gift ideas are good but give me a Thomas Hoe, aged Red Leicester to strip and I'm as happy as Larry! At the moment in the shop we have a fantastic new chutney range. Ali does a magnificent job of maintaining our vegetable garden at home whilst combining it with her netball coaching and all of the endless work she does for the shop. We have an abundance of courgettes, beetroot, runner beans, tomatoes, chillies....just an incredible supply of freshly grown veg. Being a vegetarian does mean that I can consume a fair amount of it but even I struggle to keep up so Ali found an amazing local chutney producer who uses excess stock to make her delicacies. It's amazing to think that the spiced courgette and beetroot chutneys that we are selling are made out of our spare vegetables. The number of food miles for each jar is negligible which is fantastic. 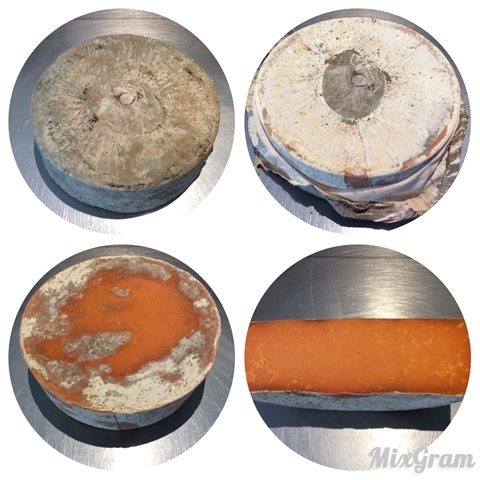 On the cheese front we have been tasting a few new cheeses which we are hoping to introduce into the counter over the coming weeks - keep an eye on our Twitter feed and Facebook page.